I sit at a desk which I keep pretty clutter free post a spell of working in an office whose policy it was to have a clean desk at the end of the day. It is helpful to wake up and come to work with a clean slate, a clean desk. On my desk I have a wide paper planner which I make fastidious notes on for monthly, weekly and daily goals and meetings. Under the planner is loose leaf paper which have a jumble of notes written during phone calls or pieces of research I have uncovered and made wild note of. These pieces of paper disrupt the otherwise calm order of things on the desk, so I hide them underneath the planner so I don’t have to see them. I know they’re there though, so should I ever need to consult the notes for anything I have them to hand. Basically I could file the info, make the decision as to whether or not I do need to keep it, but by the end of the day I am usually pretty wiped out and even deciphering my own notes and making a life or death decision as to keep or chuck it is beyond me. So I tuck them away and get on with things. 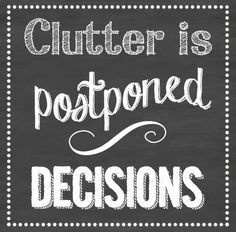 This quote very much speaks to me as yes its true, as far as I can see, clutter is postponed decisions Because for the most part decisions are hard to make and require energy and rainy days with nothing much else going on. LA is in a drought so I very rarely have any of those. Anyway, I am going to regain control of the circumstances and endeavor to run a tighter ship and take proactive decisions and live in less clutter. As I do truly believe an uncluttered desk is a calm serene mind and where the next chapter of you one wild and precious life can begin. Watch this uncluttered space.